I am working on a complex genomic research software (yes, scientists are also humans and deserve human UX) and we are streamlining our search. It has quite a few self-exclusive filters, which we are aiming to address using Selection Dependent Inputs and Progressive disclosure inspired by this great article http://www.lukew.com/ff/entry.asp?764. However we have multilevel branching logic for selection dependent inputs, that we think would be best to show to user progressively (i.e. we dont want to throw all the possible sub-options to the face of the user at once). To demonstrate our design we unfortunately cannot disclose our real use cases, so for sake of an example lets assume we are doing an astronomical research software (disclaimer: I have little idea in astronomy), that allows searching for planets (which is very close in a way to what we are doing with our genomic research software). 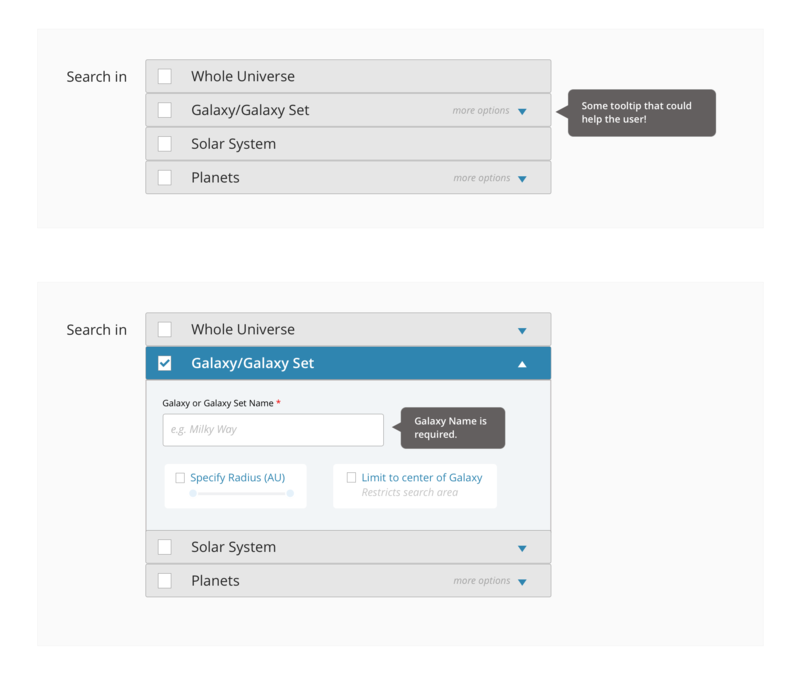 Would that be appropriate strategy for designing the complex search to make sure users are not overwhelmed with the complex branching in the search and various additional filtering options for those subbranches? 1) Group the options 1-2-3 in an accordion styles menu. Something like this. 2) Alternatively, if the options are very limited against these choices, like three four, you could think of a nested dropdown of sorts. See image attached. The important is to not overwhelm the user with an interface that has too much going on, and tried to show everything (related or not) upfront. You can think about taking him through the path that is most relevant to him/her and then supplementing the choices by a set of tags, as suggested by @uttham earlier, which serve as an indicator of the series of choices the user has made. (reference). Please find a quick design suggestion attached. As you already quoted Progressive Disclosure in your original question, this is aligned to the same principal. 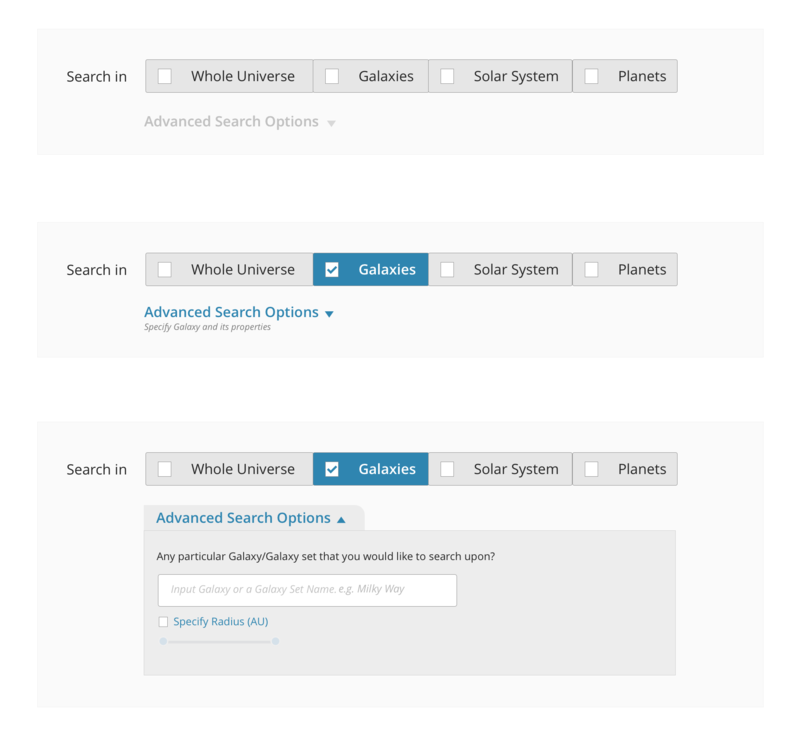 Generic users do not need all the choices laid out - and any fine tuning/detailed search is generally well accepted in an advanced search module. Also, you can try to be innovative and user friendly in designing the questions such that the user understands and inputs better. Note that using technology, you can make the system intelligent enought to understand what the user inputs. 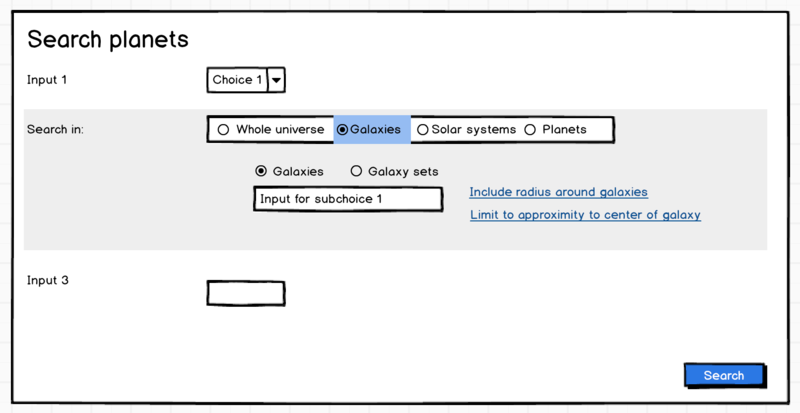 For example, as you see in the design, a choice of galaxy and galaxy set can be avoided - just by understanding the input user has given and mapping it to galaxy or a galaxy set name. Hope that helps! Well, based on your comments - I have altered the solution a bit and this is the updated suggestion. Allows, user to use the accordion without necessarily selecting that section, and viewing the options. Using smart validation, and good tooltips - you can guide the user to fill in the needed values. If a section does not have extra choices (for e.g. solar system), then it does not necessarily expand. UI is just suggestive and a good one can certainly help a lot more. and there should be provision to add custom tags by typing them. Not the answer you're looking for? Browse other questions tagged forms search input-fields multi-selection drilldown or ask your own question. Examples of online help for hands-on physical hardware components rather than software?